My grandfather and I were fighting separate wars. I was oblivious to his while I jostled over rugged mountain passes in military vehicles; while I grumbled about long hours, bad food, and the sandbag I kept tripping over on my walk to the bathroom. He was anything but oblivious to mine. Grandpa had been in the Air Force, too, back when the food was even worse but the wars were mostly cold. He retired after twenty-six years as a chief master sergeant, the highest enlisted rank. Thirty years later he bought a new uniform—in the updated design, in a size more forgiving around the midsection—and wore it to my officer commissioning, where he rendered me my ceremonial first salute. It was spring 2006. War was raging in the Middle East, but as my family posed for pictures, with me flashing my shiny new lieutenant bars, none of us seemed to realize how close it was to us. Sometimes that’s how it is with war; it creeps in slowly, low crawling through the brush and flanking you from behind. When you suddenly find yourself in the middle of a firefight, you wonder how you missed the warning shots. Other times, like in Grandpa’s case, war roars in overnight. While I was in Afghanistan, my grandparents sent me black licorice, trail mix with extra M&Ms, and bags and bags of Riesen chocolates. (I always snuck Riesens from the candy dish at their house, but I never realized they knew I was the culprit.) At the small Army outpost where I was stationed, we didn’t have a grocery store, so if I needed new toiletries my family made sure I got them as quickly as possible, Afghanistan time: 2-4 weeks. Grandma and Grandpa always included other not-quite-so-necessary knickknacks. The singing coffee mug drove my colleagues crazy, but made me laugh. In between packages, I received letters and postcards from the Oregon coast, where my grandparents vacationed a few times every year. I had been to their condo once, for New Year’s Eve, 1999. The seven of us—my grandparents, parents, sister, brother and I—huddled in front of the TV, counting down the millennium’s most influential people and wondering which electronics would short-circuit at midnight. Afghanistan was twelve and a half hours ahead of Seattle. I made a time zone conversion spreadsheet to keep it straight. There was a phone in my office that could call back to the States, and I felt fortunate to not have to stand in line at the USO, to not have to sign out a “morale phone” for a thirty-minute block, to not have strangers hovering impatiently, overhearing bits of my conversation. In exchange, I took colleagues hovering and overhearing, and an unreliable connection that frequently dropped calls and never seemed to work on Wednesdays. Every few days (except for Wednesdays) I called my parents. On the other side of the world, they worked the relative phone tree, informing everyone that I was okay, that I had eaten kabobs with the provincial governor, that the most recent suicide bombing attack was in the next province over, not ours. On his eightieth birthday, I called Grandpa. At the family party, they put me on speakerphone, and I spent most of the conversation giggling as I tried to distinguish who was yelling and whether they were yelling at me or at something burning on the stove or at one of the pets. Until Grandpa got on the line. It was the only time I ever remember him crying. I didn’t know I was missing his last Christmas. The next three months were hard on both of us. In Afghanistan, we were clamoring through what was usually the “quiet season.” Two government buildings were attacked in the nearby city of Gardez. Traces of mustard gas were found in the regional water supply, and four day’s worth of grime and talcum powder-fine dust collected under our camouflage before we were cleared to scrub ourselves clean. (The baby wipes arrived 2-4 weeks late.) A suicide bomber killed seven CIA agents at the base gym in neighboring Khost province, and one of our unit’s smaller outposts was also attacked. We were ordered to wear body armor whenever we left our offices. I scarfed down my food in the dining hall, paranoid that a mortar round or a suicide bomber would interrupt my meal. In Seattle, Grandpa ate slowly, relegated to a soft food diet. But he kept sending happy sentiments, trail mix and Riesens. My parents broke the news in the parking lot of Sonny’s Barbeque. It was late March; I had been back at my home base in Florida for a few days and was determined to eat my way through two weeks of leave. But now I wasn’t hungry any more. I said I understood. I asked all the appropriate questions, trying to read between the lines of our deployed communication. When did he find out? What kind of cancer? What’s the prognosis? He had won several battles already; with chemotherapy, radiation, tumor removal, low sodium and hospital Jell-O. But Grandpa would lose his war. One night I slept on the couch beside the hospital bed, jolting awake when the springs creaked or when Grandpa moaned in his sleep. Earlier, before I tucked him in and nestled into the cushions, we talked. I turned on my voice recorder and asked him questions I’d been meaning to ask for a long time. The lamplight basked him in a deceptive glow. It softened wrinkles and diffused the blue veins that now reached with such prominence across his bald head. Medical equipment dripped and buzzed in the background. The grandfather clock reminded us, in fifteen-minute increments, that our time was limited. Grandpa’s voice was weak, but clear. His mind took leaps I couldn’t quite follow, but I let it empty itself into my recorder. He talked about his childhood, how at school he had cut more classes than any of his peers, and how at home he had tried to shelter his sisters from their father’s violent alcoholism. When he joined the Air Force, he sent half his salary to his family. He told me how he met my grandmother during his initial period of military leave, how, at a feisty eighteen, she had hooked him after just one date. His wistful smile affirmed that fifty-eight years later he was still hooked. When my uncle and father were born, Grandpa said he vowed not to make the mistakes his father had. He talked about being stationed in Italy—back when you had to commute and ship your household goods (and wife and kids) by boat—and later in Germany and Greenland. He hadn’t planned on staying in the Air Force, but the lure of travel changed his mind. I thought of the collector’s plates that lined the walls of his basement. When I was little I used to sit in the orange polyester chair and gaze at the souvenirs in awe, marveling at all the places my grandparents had been. Someday, I decided, I would go to those places too. I smiled when I realized, at twenty-six, how far along I already was. Grandpa told me that at the end of his career he had been nominated to represent the entire Air Force enlisted service as chief master sergeant of the Air Force. We reminisced about winning the “Best Dressed Family” award at my commissioning: the chief; my mom, the Army lieutenant colonel; my other grandfather, the Navy lieutenant commander; and me, the wet-behind-the-ears lieutenant. Grandpa’s throat rattled when he laughed. He told me how proud he had been of me four years ago. He told me how proud he was of me now. He mentioned the orders I had received to report to report to Korea eighty-seven days after I got back from Afghanistan, and mumbled, not for the first time, that the Air Force wasn’t what it used to be. “I guess a lot changes in thirty years,” he chuckled. “A lot changes in four years,” I said. A lot changes in one year. A lot changes in twenty-four hours. That was Grandpa’s last lucid night. I left a few days later. The next month I returned for his memorial service. He is there in a shadowbox on my Grandma’s dining room hutch, framed by a folded flag and a row of military decorations that seem so few for all his accomplishments. In the picture he’s young again. Not youthful, but healthy and resolute—just as I remember him—his smile never betraying all the wars he fought alone, all those he helped others through. I have my Grandpa’s smile. I like to think I inherited some of his strength. Lauren K. Johnson, an Afghanistan veteran and former military public affairs officer, has won regional and national-level Department of Defense journalism awards. She hails from Edmonds, WA, majored in English at Loyola Marymount University in Los Angeles, and was stationed in Florida with the Air Force. After honorably completing her military service, Lauren moved to Boston to accomplish her goal of living in all four corners of the U.S. (Her well-traveled cats have accompanied her for three.) 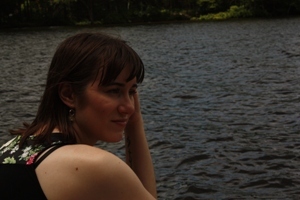 While in Boston, Lauren is pursuing an MFA in nonfiction writing at Emerson College, where she is completing a memoir about the experience of female soldiers during and after war. She blogs at uncamouflaged.blogspot.com. Wow Lauren. You are well on your way. I’m very impressed and moved by your story. Hi Lauren! Beautiful story, you’re very talented. Your grandfather sounds like an incredible man, I wish I had been at your commissioning…it sounds like it was quite the day for your family! Best of luck, and I hope you keep writing, I enjoy reading your work! What a moving piece. Lauren weaves the realities of two very different wars together beautifully, showing the impact military assignments have on families through the generations. I look forward to reading more of her work! Very touching Lauren – Grandpa would certainly be proud! And remember, you were a bright light to many of us in dark and dusty Afghanistan. Well written story, it brought tears to my eyes. You are already a good writer, I will love to see more. I liked your blog in Afganistan too. Absolutely incredible writing. And an incredible story of two heroes, each separated by generations and thousands of miles, but so close at heart. Well done Lauren, I look forward to reading more. Thank you so much for your service, your bravery, and your honest writing. Beautiful composition/tribute Lauren. While reading it, I felt as if I was there. It was akin to watching a short episode of The Waltons (one of my favorites from yesterday’s tv). I’m impressed with your talent and wish you much success. And if your grandpa could somehow communicate on your work here, I’m most certain that his message would be all too familiar as he once again conveyed just how proud he is of you,. Very touching story. I was drawn in from the first paragraph and couldn’t stop reading. I’m sure your grandfather would be very proud. Thank you all for your kind, thoughtful comments. Knowing people are interested in what I have to say keeps me going through writer’s block! And thanks to Mason’s Road for my first creative writing publication! Beautifully done. You’ve made Norm proud as he could possibly be… yet again! What a gift you have… and what a gift this is to all of us. great put up, very informative. I’m wondering why the other specialists of this sector don’t notice this.